can’t wait to showcase some ideas! Thank you so much for hosting. I’d love it if you would join in a bloglovin’ blog hop over at http://www.thenymelrosefamily.blogspot.com. Thank you for hosting such a great party full of inspiration! Thanks for hosting Stephanie Lynn! Have a great week! 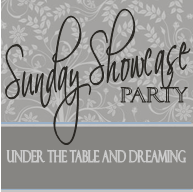 It’s my first time participating in the Sunday Showcase Party and I’m having a great time checking out new blogs and picking up new project and recipe ideas. Thanks for hosting this! Thank you for hosting and hope you have a great week too! I’m so glad I came across your blog. I LOVE it! I’m your newest follower and I just linked up my latest project! Thanks for hosting 🙂 Have a fab week! Thank you for hosting! I haven’t been linking up because I’ve been working on some crafts to post about! Funny how you can get behind in that :). Have a great week! What a great collection of blog posts! Thank you for hosting the blog hop. Now following your: twitter, FB and Pinterest:).